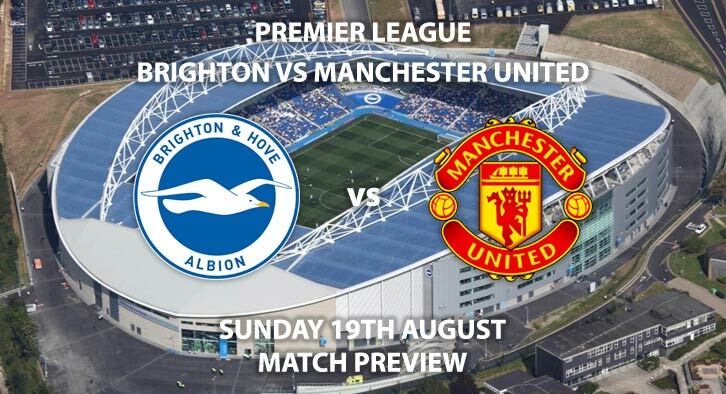 Brighton and Hove Albion vs Manchester United is this Sunday afternoon’s main game from the Premier League. Both sides opening matches faired rather differently as the hosts were swept aside by Watford at Vicarage Road. Meanwhile, Manchester United slightly rode their luck against a tricky Leicester opposition. They came out 2-1 victors. Chris Hughton will be hoping for a much more composed Brighton performance, who are priced at 17/4 to win this match by SkyBet. They also face tough opposition after Sunday, with Liverpool next up. Lone striker Glenn Murray struggled up top in the opener however could cause problems for the small sized United defence. His aerial ability will be key, as he is priced at 11/2 to score first. Their hard-working wingers also struggled to penetrate down the flanks and will struggle once more given the impressive performances of Matteo Darmian and Luke Shaw in the first match. Brighton only managed two corners in their curtain raiser and are priced at a tempting 11/10 to have 0-3 corners in this match. Manchester United will have to improve their performance over 90 minutes and are priced at 3/4 to make it two wins from two. Their attacking creativity lacked at times against Leicester with Jesse Lingard a big loss. Paul Pogba stepped up to the plate in midfield alongside youngster Andreas Pereira and new signing Fred. However, Marcus Rashford struggled to make an impact in the new number 10 shirt and Romelu Lukaku didn’t do much better. Expect Rashford to come all guns blazing as his pace can disrupt the Brighton defence. He is priced at 9/2 to score first. The referee for this match will be Kevin Friend. The official only gave two cards in his first match of the season. However, both sides showed aggressive tendencies in their last matches so expect cards. Brighton and Hove Albion vs Manchester United will be televised live in the UK on Sky Sports Football with kick-off at 16:00 GMT. Prediction: Brighton 0 – 2 Manchester United. The Red Devils will be polishing up their shooting boots after some frustration last time out. Brighton will find it hard to contain the quality and depth of United’s superstars. Manchester United to win 2-0 – (link no longer available). Correct Score Group Betting – Manchester United to win 1-0, 2-0 or 2-1 – 6/4. Scorecast Boost – Marcus Rashford to score first and Manchester United to win 2-0 – 20/1. Manchester United -1 Goal Handicap – 2/1. Odds and markets last updated on Sunday 19th August 2018 @03:50 GMT. Keep checking back to see if there’s any updates to markets – the time stamp in the previous sentence for when we update tips on this page will be updated.